Is There a “Mob” Mentality or are Mobs Just “Mental”? | "Northern Crossings"
Is There a “Mob” Mentality or are Mobs Just “Mental”? After showing the protesters trying to rip themselves into the Supreme Court building, the news organizations that have been accused of “fake news” said that it was not a mob. Hunting down Senators in their offices and blockading them in elevators and screaming at them is not considered a mob mentality. Trying to rip elderly people out of a car and beating them up simply because they a) white and b), are driving down a road where people are protesting is not considered mob activity. Think of what we have been saying on this blog over the years about the meaning of words and the fact that words mean things. Look at the words that mean whatever certain people want them to mean and the way phrases are twisted to cloud or obscure the truth. Politics of a certain nature corrupts whatever it touches because it denies, as a matter of practice, reality and wants to confuse issues and voters. Now we have the word “mob” being redefined. A mob is people gathered peacefully at a rally who actually seem happy and jocular and may chant “lock her up” on occasion. A gathering of such people at Fargo one day was called by some, a mob. No fires were set, nothing was defaced, and people enjoyed themselves but it was called a mob. We know there was an organized mob that came and protested at the pipeline sites here in North Dakota and created an environmental disaster. We know that they were paid for by a political party. We know there was an organized rally that turned Paul Wellstone’s memorial into a political rally that sounded like a mob. We saw video of the craziness that took place in the Senate having to be organized by teaching folks what to say by rote. A guy on a ladder shouting “I am here to see my Senator” and the crowd repeating like robots shows how a mob is created. I wanted the video to show the guy saying “I am here to see my Senator and then say your Senators name” and have the crow repeat the same words exactly. What I have seen of these angry folks is that they don’t know who their Senators are and some of them, I am convinced, have no idea what they are protesting or what they believe. By the way, for those of you out there who are desperate to hire folks to work for you, good luck with these folks. CEO’s of companies that are hiring may have to spend a few days in a rally session telling new hires to repeat after them the rudiments of going to work and doing a job. Think of the folks that are running for office now that have economic degrees from some so called prestigious colleges, who think that the electoral college developed because of slavery. They are going to need remedial civics classes to even understand the nature of their jobs. Where do mobs come from? Well here might be a hint. ROSEMOUNT, Minn. (AP) — A Minnesota teacher has resigned after a message allegedly appeared on her Twitter account suggesting someone should assassinate new U.S. Supreme Court Justice Brett Kavanaugh. The Rosemount special education teacher has since deleted her Twitter account, but a tweet that read “so whose gonna take one for the team and kill Kavanaugh” was reported by Twitter users to the FBI and Secret Service. A scientist with no data that calls people who reject his hypothesis deniers has some issues, but the point is these are educators who can have the capacity to get young folks who by definition are stupid, (that is why they go to school) riled up into a mob is classic. By the way this guy is from Minnesota too. We write this blog about the connections between North Dakota and Minnesota and the partnerships we have together. I would like to thank Minnesota for sending their rent- a -mob folks to North Dakota to corrupt the Cannonball River and raise all kinds of hell but maybe you didn’t know what your politicians had cooked up. Minnesota is also selective about when they call for a mob. They asked for one when there was an accused women abuser and there was no evidence of abuse. They not only don’t want a mob around an accused abuser when there is actual evidence because he is a Minnesota politician that checks all the boxes on craziness. “Two weeks after the Democratic National Committee (DNC) announced a review of domestic abuse allegations against Minnesota Democratic Rep. Keith Ellison, the public still has scant information about the probe. Notice there are no calls from the party to have a mob go to Ellison’s offices, confront him on the streets or in cafes and accost him whenever he appears. So the wonderful word “mob” gains access to those special words that mean what a certain political party says they mean, no more and no less. 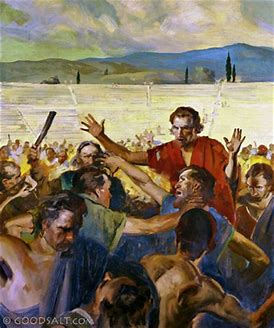 I still like the definition of mob from the Bible – notice that Luke is putting the best construction of everything and calls the a “crowd” or an assembly. Apotheosis, Heroism, Self Loathing and Racism.